The Washington Spirit Reserves notched their sixth consecutive victory (fourth in the W-League) in dramatic fashion, knocking off the visiting New Jersey Wildcats 5-0 Saturday evening at special venue site Liberty High School in Bealeton, Virginia. Led by forward Morgan Reuther’s three goals in the first half, Washington got ahead of New Jersey early and the stout Spirit Reserves defense held the Wildcats scoreless for the second week in a row. In striking similarity to last Sunday’s road victory against the New York Magic, the Spirit Reserves managed to get on the scoreboard in the opening minutes. Washington defender Jen Skogerboe slotted a nifty pass ahead of Reuther into the right corner. The agile Reuther faked right and cut left inside her defender before firing the ball untouched into the right corner of the Wildcats net for the 1-0 lead in the 3rd minute. A corner kick opportunity four minutes later doubled the Washington lead as Reuther took advantage of a chaotic scramble in front of the New Jersey goal mouth. After the deep cross pinballed off of several players from both sides, Reuther crashed through and drilled the ball into the upper netting of the Wildcats goal for the 2-0 advantage in the 9th minute. A second-year forward at the University of Virginia, Reuther completed her hat trick just before half when teammate Ashley Herndon fed her a splitting pass through the middle in the 40th minute. The speedy Reuther calmly buried her shot past diving Wildcat keeper Carlie Till to complete her scoring on the night. The Spirit Reserves grabbed an unexpected goal just before the halftime whistle as Herndon launched a 30-yard strike just under the crossbar for the 4-0 lead at the break. Second half Washington substitute Lina Granados showed her hat trick from last weekend was not a fluke as she raced down the right side after collecting a pass from midfielder Kara Wilson in the 56th minute. Granados smacked her authoritative shot into the New Jersey goal to conclude the scoring for the Spirit Reserves. The victory keeps Washington atop the Northeastern Conference with a perfect 4-0-0 record. The Ottawa Fury and Los Angeles Blues also currently boast unblemished records in the first third of the W-League season. The Spirit Reserves continue their W-League season next weekend on the road for a pair of away matches. On Saturday, June 14th, Washington faces the Long Island Rough Riders before following up the next day against the North Jersey Valkyries. The Spirit Reserves return home June 21st for a rematch against the New York Magic. Match time is set for 3:00PM at the Maryland SoccerPlex and is the first in a special doubleheader. 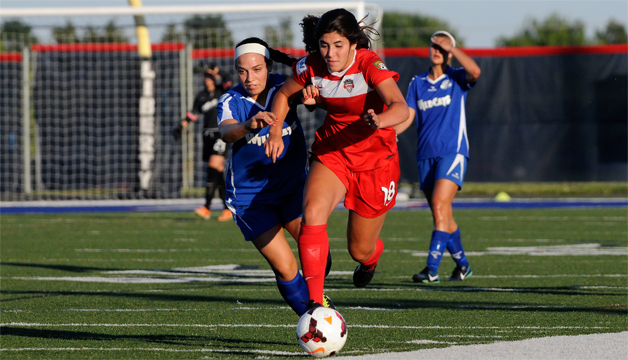 The NWSL Washington Spirit face the Portland Thorns in the second match of the evening.